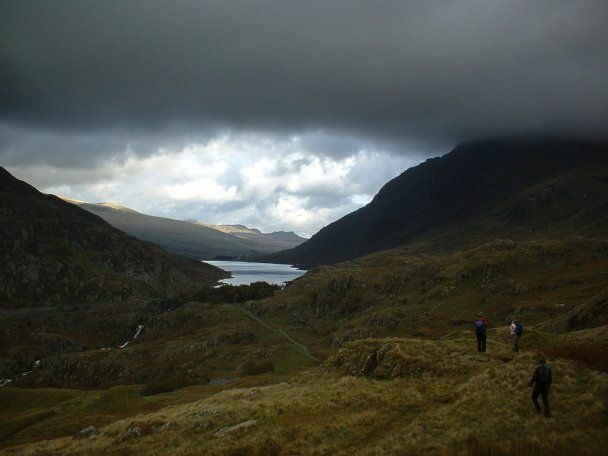 This photo was taken last year when I went to Snowdonia with the Hill and Mountain Walking Club. At some point on the way up to the top of Snowdon (I think). I was having quite a stressful time at uni at the time (nothing ever changes…) and the chance to get away and see some stunning scenery was refreshing. I think this photo is quite dramatic. Maybe could do something with it with a better camera / motivation to play around in paintshop. Very beautiful; I wish I'd had the time to join Hill & Mountain. It's always great to have a chance to get away from uni for a little while – I did with PhotoSoc (hint, hint!) amongst others. The photo doesn't need much work at all: contrast looks good, and brightness is OK. Apart from cropping about half the cloud at the top and possibly lifting the foreground very slightly, I like it! I like it, just as it is. Looks very cool and I love being out away from the 'modern world'. I loved that photo and had it as my desktop picture for about two weeks after you sent it to me! (I'm the peron in the pink top of the right of the pic if you don't remember me!). That was a great walk, I think we were coming down from Y Garn on the Sunday led by the lovely Colin. You really did manage to get some great pics that weekend :-). Thats a gorgeous photo, nature is so beautiful and I like that there are people in it too! Amazing snap, I'm loving the way there's that big dark cloud enveloping the hill on the right, so close you can touch it, and yet there's sunshine in the background.